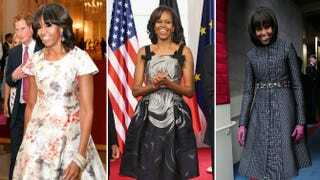 Since her husband secured the Democratic nomination for president, Michelle Obama has become one of the world’s most-watched style influencers. Five years in the national spotlight have not dampened enthusiasm or interest in her fashion choices, with “Who is she wearing?” remaining one of the most common questions asked the moment she steps out in public. As 2013 comes to a close, The Root revisits some of her best, brightest and most beloved style moments from the past year. Please feel free to let us know if you believe we missed any in the comments section. Usually the inaugural ball gowns steal the show, but during the last inauguration, it was the first lady’s daytime look that made the critics cheer. She wore an extremely tailored Thom Browne coat that read "high fashion," and rocked knee-high boots and a jeweled J. Crew belt that shouted "youthful and fun." Anyone who thought the first lady would not be able to top her inauguration ensemble was quickly proved wrong. She wowed fashion lovers in another chic coat and matching dress by Naeem Khan, which she donned at the National Prayer Service following Inauguration Day. Most people are lucky to go to one glamorous event a year. The first lady sometimes attends two in one night. On Feb. 25, she served as hostess of the 2013 Governors Dinner. Then, later that evening, she helped pull off one of the best-kept secrets in showbiz when she surprised the audience at the Academy Awards by appearing via satellite to present the best picture award. Clearly one needs an über-glam gown to float between two very different but very glam events. Once again, Naeem Khan delivered. The shining silver and black evening gown made the first lady look right at home among Hollywood’s starlets and superstars. After the horrific Boston Marathon bombing, which claimed the lives of three and injured hundreds more, the president and first lady came to Boston to comfort rattled residents and Americans across the nation. Though fashion is superficial in light of such a serious event, the first lady’s dress conveyed dignity and empathy. En route to Dallas for the opening of the George W. Bush Presidential Library and Museum, Mrs. O rocked a fabulous fuchsia sheath that called to mind some of her best Maria Pinto looks from the 2008 presidential campaign. What does one wear to meet a prince? Well, the first lady answered that question with this knockout dress by Prabal Gurung, which she previously wore for an appearance on Live With Regis and Kelly. During a visit to Germany that included dinner with Chancellor Angela Merkel, the first lady went for a girlish look, in a classic Carolina Herrera dress. Michelle Obama looked right at home in Tanzania in a stunning, bold-print dress by designer Rachel Roy. In a look that called to mind Jackie Kennedy vacationing on Hyannis Port, Michelle Obama sported a Talbots dress with a vintage look as she and her family headed to Martha’s Vineyard for vacation. The first lady wrapped up the year with a fashion bang, dazzling the cover of Ladies’ Home Journal in a gold dress, another winner from designer Lela Rose.